A seating plan for your wedding, special occasion or corporate event is a crucial part of the organisation. For a wedding, the time you spend, considering carefully where your relatives and friends are going to sit, is time well spent. The same applies for a corporate or special event where you want your guests to remember your event for all the right reasons. Whatever the occasion, the more time you spend considering the table plan and the seating arrangements for your guests the greater their enjoyment. Once you have confirmed your seating plan you can then commission a table plan for your event. A well designed table plan clearly shows your guests where they are invited to sit thus avoiding any confusion or indecision. Essentially a table plan is a seating diagram. At wedding banquets, the bridal party and their guests usually sit in pre-arranged groups of relatives and friends, each group being seated at a different table. A table plan is usually displayed at the entrance to the wedding reception to help each guest to find their particular table and to tell them who else is among the party at their table. 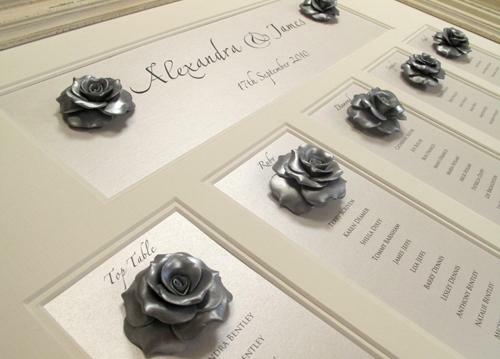 We pride ourselves on our stylish, contemporary and bespoke table plan designs. There is no 'formula' to what we do; no two table plan designs or colour schemes are ever the same. We use the highest quality boards and frames. We design and create, in house, all of our beautiful handmade embellishments and offer a wide range of fabulous diamante and diamante & pearl buckles and embellishments. For examples of our work please view our 'Showcase' gallery. As handmade wedding stationery designers and publishers we speak from experience and hope that the information we provide on this website is both useful for arranging your seating plan, commissioning your table plan or even making your own table plan. Please visit our sister site The Handcrafted Card Company for more table plan designs and our coordinating wedding stationery along with our online Craft Shop for all the items you need for making your own table plan, DIY table plans and wedding invitations. 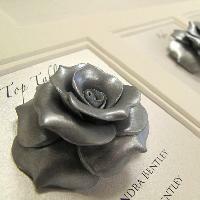 Our craft shop has a department dedicated to 'Wedding Venue Styling' including chair buckles, chair brooches and coordinating embellishments for napkins, table decorations and floral decorations. We also stock dazzling Swarovski table crystals and diamonds and a host of other high quality products especially sourced with weddings in mind! We work really closely with our clients offering a truly bespoke service. We hope you enjoy viewing our websites!